Gearing products (components or housed gearboxes) are mechanical devices used to increase the output torque or change the speed (RPM) of a motor. Power-On Brakes are used to stop or hold a load that is coupled to the armature hub assembly. The armature hub is attached to the load shaftThe field assembly is mounted to a bulkhead that is perpendicular to the shaft. They are also used for inertia matching between a load and a motor. The most common type of gearing product is a gearbox (or housed gearhead). 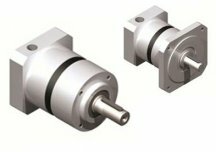 Gearboxes come in a variety of types: Planetary, Strain Wave Gearing, Bevel, Helical, Spur, Cycloidal, etc. Power-Off Brakes are designed to decelerate or hold an inertial load when the voltage is turned off. When voltage is applied, the friction disc is released and the brake is free of torque. Power-off brakes are best suited for parking brake applications used to hold a load in position, and are ideal for creating brake motor packages for small servo & stepper frame motors. Power-on/off brakes are offered in flange mount, C-Face and NEMA frame versions. Power-on Clutches are used to couple two parallel shafts. The armature hub assembly is mounted to the same shaft as the rotor assembly. The armature hub accommodates a pulley, gear, sprocket, etc., to transmit torque to the second shaft. The field assembly is mounted on the shaft and retained by a loose fitting pin or bracket through the anti-rotation tab.